Bouncing and weaving down South Bank in an effort to keep up with the sunlight seemingly fleeing from me, my t-shirt - jeans - lined jacket combo started to feel a little too well-prepared. On one hand that was a pretty great achievement considering I'd been wandering around for almost five hours and it was only now proving a disappointing decision. But on the other, I'm surrounded by dresses and shorts and even my handbag strap is causing my skin to sweat. The afternoon air is warm, hazy, and thick with sound; of commuters on their way to the pub after work, of excited tourists with selfie sticks, of skateboard wheels on the pavement, of electronic beats playing from stalls, of cheers from a crowd watching a tennis match on a huge screen to my right in the green space infront of the Tate. 'Who's playing?' I here someone ask his friend as I turn to the screen to look myself. I stop for a moment to let the words come into focus. I stay to watch the serve, the return, the forehand, the forehand and one more backhand before turning to continue down the river. But I stop. Right here. I close my eyes and listen to the cheers, the sighs, the laughter, the applause going on behind me, natural, light-hearted human emotion. I inhale the smells of freshly cooked enchiladas wafting from a stall further down. I open my eyes and watch all the different people walking past. The clothes, the chatter, the moods, the manners. 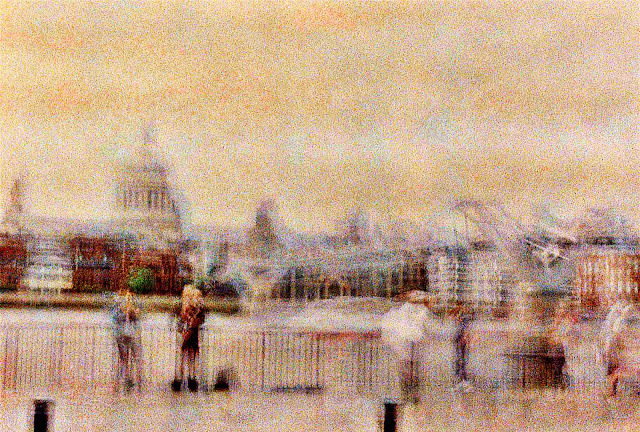 Looking along the river, I smile at the memory of a perfect summer's day in St Pauls now opposite me and a beautiful sunset I once watched from the Millenium bridge to my right, how the clouds carried those brilliant orange and pink hues. Now thick cloud is starting to soak up a much more deeper orange. I take my camera, find a flat surface and click, 2, 3.